Sending developers to read docs, wikis and tests just to understand your system is a time-consuming and oft-ignored task. Ruby code should be readable! Get a sample chapter of Clean Ruby and you'll be added to my periodic newsletter of helpful Ruby tips. Jim is author of Ruby DSL Handbook, the Lead Developer for Radiant CMS and is a prolific contributor to it and many open-source projects. At Saturn Flyer LLC he’s built numerous Radiant sites, custom applications, and award winning graphic design and has had his designs published in HOW Magazine and The Best of LogoLounge. He’s been a co-host of the Ruby 5 podcast, speaker at RubyConf 2013, RubyConf 2014, Ruby Kaigi, Wroclove.rb, ArrrrCamp, and RubyNation, co-founder of Arlington Ruby and has been professionally building Ruby and Rails applications since 2006. 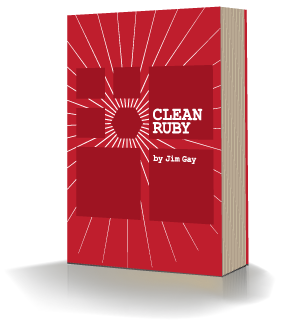 Clean Ruby by Jim Gay is a book about writing code that makes you and others happy. Copyright 2013-2015. All rights reserved. Send jokes about your dirty Ruby to jim@saturnflyer.com. Or send questions, I like them too.